Add a bit of oomph to your look with this stacked ring that spins at your touch. Adults fidget, too, so give your plastic corner store spinner a style-friendly upgrade with this tactile ring. 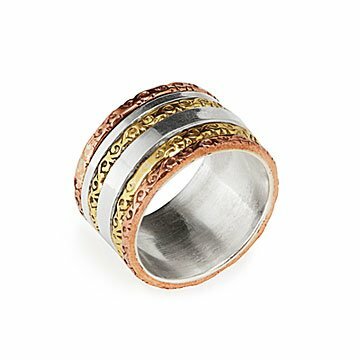 Bookended by strips of textured copper, thin rings of brass and sterling silver—some patterned, some plain—spin freely as your restless fingers push them along, adding a bit of velocity to your look. Oh… and those metals? They're not just cool-looking, they're ethically sourced, so you can feel extra good about your ensemble. Handmade by artisans in India. Use warm water and a polishing cloth to clean. The inside of the ring is extremely smooth, making it easy to slide on and off.